Richard Eugene Manning (born September 2, 1954 in Niagara Falls, New York) is a former center fielder and current broadcaster in Major League Baseball (MLB), who played for the Cleveland Indians (1975-1983) and Milwaukee Brewers (1983–1987), and has been a color commentator for Cleveland Indians telecasts since 1990. Manning, who was the second overall selection in the 1972 MLB draft, made his major league debut with the Indians during the 1975 season. In 1976, he was recognized for his defensive play by winning the American League Gold Glove Award. Manning's involvement with teammate Dennis Eckersley's wife led to the Indians' front office's decision to trade one of the players. Eckersley, a future Baseball Hall of Fame pitcher, was traded with Fred Kendall on March 30, 1978 to the Boston Red Sox for Rick Wise, Mike Paxton, Bo Díaz and Ted Cox. After playing five more seasons with the Indians, Manning was traded to the Milwaukee Brewers during the 1983 season. As a member of the Brewers, he hit a 10th-inning single on August 26, 1987 as the Brewers defeated the Indians 1-0. Brewers fans actually booed Manning for driving in the winning run because Paul Molitor was on deck and looking to extend his 39-game hit streak. Manning's walk-off single deprived Molitor of one last chance to reach 40 games as he went 0-for-4 in the contest. On May 15, 1981, Manning caught Ernie Whitt's fly ball the final out of Len Barker's perfect game in one of the most memorable images in Cleveland sports history; the Indians defeated the Toronto Blue Jays 3-0. 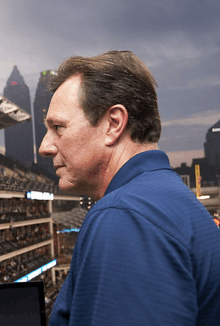 Since 1990, he has served as a color commentator for Indians telecasts. Manning has the longest tenure of any television announcer in team history. Manning can be seen doing Tribe games on SportsTime Ohio (alongside Matt Underwood). He resides in Chesterland, Ohio, during the season, and Goodyear, Arizona, (the spring training city for the Indians) in the offseason. He also occasionally provides color commentary on regional broadcasts for Major League Baseball on FOX, mainly when FOX shows an Indians game. ↑ "Manning wins award". Cleveland Plain Dealer. Retrieved 2014-05-02.